We’ll start with an overview of the most common mesh architectures. octoScope, the leader in accurate, repeatable and automated wireless testbeds, today announced its new Wireless Mesh and IoT Test Methods training seminar, to be held at its San Jose office on Thursday, October 19, 2017. Mesh networking is emerging as a way to easily improve Wi-Fi coverage in the home and to interconnect new IoT devices, such as thermostats, window and door sensors, security cameras and medical devices. While the latest developments in mesh technologies promise to improve the performance of bandwidth-demanding Wi-Fi applications, such as Wi-Fi enabled set top boxes, they also introduce complexities. The challenges for the wireless industry include the efficiency of self-forming and self-healing wireless meshes and the mechanism to steer stations to the best access point or frequency band. The ultimate challenge is to get the best performance under a variety of real-life impairments and interference in the air. The seminar will begin at 10 a.m. at the octoScope office at 780 Montague Expressway, Building 1 in San Jose, CA. An overview of the evolution of mesh technologies, including 802.11s, Nest/ZigBee and Bluetooth will be followed by a discussion of common 3-node mesh architectures for Wi-Fi. Typical performance of the products on the market will also be examined. New test methods for validating mesh networks will be demonstrated via hands-on use of the octoBox testbeds configured for mesh testing. Measurements will include MIMO-OTA throughput via a mesh network, roaming and backhaul performance. This seminar is for wireless test and development engineers and engineering managers. The octoBox personal testbed is being used by wireless operators, device manufacturers and chipset vendors to test Wi-Fi, LTE, ZigBee, Bluetooth and other wireless technologies. The octoBox is an accurate and automated testbed for validating wireless devices and systems. With its complete isolation and consistent controllable test environment in labs around the world, the octoBox solution is highly-praised by its diverse users. octoScope is the market leader in accurate and repeatable automated wireless personal testbeds. Our patented technology redefines the accuracy, stability, economics and value of over-the-air wireless testing. octoScope’s product line includes robust solutions for isolation, interference generation and evaluation, client emulation, and essentially all of the elements required to evaluate the behavior and performance of a broad range of wireless devices and systems. 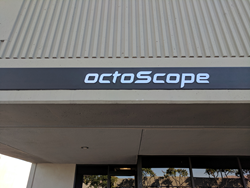 octoScope’s headquarters is in Littleton, Massachusetts. For more information on octoBox personal testbeds, please visit http://www.octoscope.com.